The principles that I want to write about today, those guidelines for having a good argument, apply to nearly all types of relationships. That includes relationships with spouses, friends, coworkers, and family. There are exceptions of course. Some modifications, for instance, would be needed when addressing disagreements a parent might have with a child. But in general what is to follows applies to most relationships. A Good Place To Begin: Accept that disagreements will happen. Research shows that in many good relationships there is just as much arguing as in poor relationships. Again, disagreement happens. It’s all about how disagreements are handled so that they DO NOT become destructive. To make things more clear, let’s look at some examples of these different outcomes. 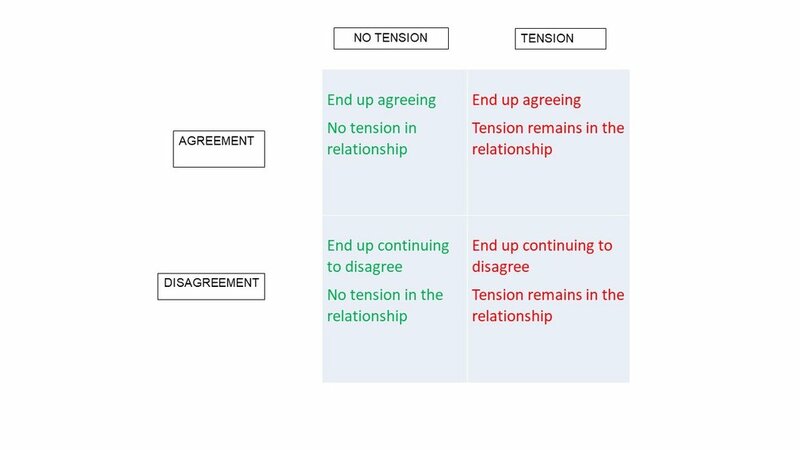 Agreement/No Tension: This might occur when one person comes to accept the other person’s position, the disagreement did not lead to personal criticism, and both people go away feeling understood and respected. For instance, a husband and wife argue over where to go to dinner. The wife reminds her husband that he had said that they would try a new Italian restaurant. He remembers having said that, and it’s settled. They are headed out for pasta. Agreement/High Tension: This is the same scenario but the argument ends with tension. The husband tells his wife that she is crazy and imagining things about what he said regarding dinner. The wife tells her husband that he is a selfish pig who clearly remembers what he said but has changed his mind and is now acting so innocent. The husband ends up thinking to himself “I’m never going to hear the end of this, I might as well just go to the stupid Italian place.” They go, speak very little to one another over the course of the evening and return home angry. They ended up agreeing, but the road they took to that point created all sorts of problems that they will need to sort out. Disagreement/No Tension: Neither person comes to accept the other person’s position. The disagreement did not lead to personal criticism, and both people go away feeling understood and respected. Let’s look at an example. A husband and wife argue over his having spent money on a new shotgun when they had just talked about the need to save money for an upcoming vacation. The husband explains that he needs the shotgun to go duck hunting with his friends. She reminds him of their planned vacation and how they still need to save more money for the fun activities they had planned. He says the gun did not cost that much and they still have enough money for a great vacation. Besides, he reasons, it’s really important to him to have this time with his friends (which from his view, requires that he have this new shotgun for hunting). The wife continues to point out that he should talk with her before buying a 1000.00-dollar shotgun. The vacation is important to her, as it is a chance for them to be away and reconnect. On this note the discussion ends. Not really very satisfying, yes? Nevertheless, they go away from that disagreement with very little tension because there were no personal attacks. No one leveled personal criticism; no one’s opinion was dismissed as stupid. Past mistakes were not brought up in order to beat the other into submission. They argued in a fair and thoughtful manner. So even though they continued to disagree about the purchase the husband had made, they could both agree about the importance of their planned vacation, and of finding ways to connect with friends. Disagreement/High Tension: Neither person comes to accept the other person’s position. The disagreement lead to personal criticism and both people go away feeling misunderstood and/or disrespected. We could look at the previous example and simply change some specifics to get to the ‘high tension’ state. Just insert a few accusations of the husband being selfish and irresponsible. Then add a few retorts about the wife being a buzz kill and a controlling nag. You see where that type of exchange quickly goes off the rails. Yikkes! When examining marriage, research shows that happy couples disagree about the same amount of time as unhappy couples. This can be applied to relationships in general: the good and bad ones are not distinguished primarily by whether there is disagreement, but by two other things. Our aim in disagreements with those with whom we are close should be to keep in the green zone of the chart (see above). When we are able to do that, we keep a “positive balance” in the emotional bank attached to that relationship. Relationships are a little like bank accounts. You want to put more in than you take out. Positive interactions, even those occurring during disagreements, act as deposits. Negative interactions act as withdraws on the account. Research shows that healthy relationships have a minimum of a 5 to 1 ratio of positive to negative interaction. Every negative exchange you have with your spouse/partner/friend is like making a withdrawal from that emotional bank account. Every positive exchange is an investment. When you make too many withdrawals, the account is in deficit mode. You’re broke! If you stay broke, the bank may close the account. Same with your spouse, family or friends. I don’t want you to go broke! So the take away is to learn how to manage disagreements in a way that keeps the emotional account healthy and robust. For most of us this takes effort. Sometimes a lot of effort. And practice. I’ve listed below some easy things that any of us can use to keep arguments from exacting a toll on our relationships. Those who diligently practice these methods might even be rewarded by strengthening their relationships when they get into arguments… but those people are rare, sort of like the Yodas of the Jedi Warrior class. 1. Schedule your disagreements. This is one of the most important tips. Why on earth should any of us get into an argument with a spouse or friend simply because a disagreement has come up? Sure, there are times when a conflict has to be resolved at that moment. But most of the time it can wait. Why not just agree that this is something you should discuss, and find a time when both of you can sit down and talk it over when a healthy outcome is more likely? When we argue because emotions have become heated in the moment, we become servants of our feelings. This seldom works out well. Let your rationale mind decide on the time to argue, then you will be able to express your feelings much more clearly, and take into account the feelings of others. The alternative is that you argue because the dispute has come up at that particular time. Guess what? That particular time is likely to be one that is not good for settling a dispute. Emotions have probably risen some, it may be that the kids need dinner, or there is an appointment one of you needs to rush off to in five minutes, etc. It's much better just to acknowledge that whatever the dispute may involve, it would be good to give it the time it deserves. You can do this by scheduling the argument for later in the day or even the next day. 2. Press The Stop Button. If you are in an argument and tempers have begun to rise, suggest that the dispute be “put a hold.” Disagreements are seldom settled in a constructive way when one or both people are angry or highly emotional. The only caveat to this is that there needs to be a set time to return to the topic and finish the discussion. 3. Post Argument Cooling Off Period. Understand the need for the other person to ‘regroup’ after an argument: for some it may be some alone time, for another it may be time in the gym. If you are someone who typically needs a cooling off period after an argument be explicit about your intention. Tell your spouse or friend. That way he or she is less likely to see it as a rejection, but rather as your way of regrouping so as to be able to get the relationship back to normal. 4. Avoid personal criticism. This is an obvious one. But what is not obvious is how subtly criticism can be conveyed. So make sure you are not shaking your head in disbelief during an argument, or eye rolling (interestingly, this is a universal facial sign of dismissing someone else). 5. Respect for the other person’s point of view. Avoid dismissing the other’s view as uninformed or unimportant. Tell the other person that you understand their point of view (if you do). That is not the same as saying you agree with them, simply that you understand their perspective. 6. Focus on facts. Don’t let the argument wander into focusing on the other person’s motives (e.g., “You’re only doing this because you want to look like a saint”; “You’re just afraid that I might have something useful to say”, etc.). 7. Compromise. When possible, compromise. This requires us to push our egos out of the way. When egos get involved, it poisons an argument because then we start to say things to defend our ego. Conversely, don’t make personal criticisms of the other person; it only makes them want to defend themselves. Everyone will have disagreements with the people who mean the most in their lives. That’s to be expected. How you handle these conflicts is what makes the difference between a good relationship and a troubled relationship. Having a constructive argument is not easy. But what choice do we have if we want to have close, rewarding, and long lasting relationships? One of the very best ways to avoid destructive conflicts, something that was not mentioned earlier, is to add value and interest to your relationship during those times when there is no conflict. Put a little differently, be sure to enjoy time with one another. Make an intentional effort to engage your spouse, friend, sibling in ways that leave both of you feeling more bonded. That might be as simple as sharing a few laughs over a cup of coffee, or as unusual as going on a joint adventure such as sailing down the coast, or running a 10K race. A metaphor might help. 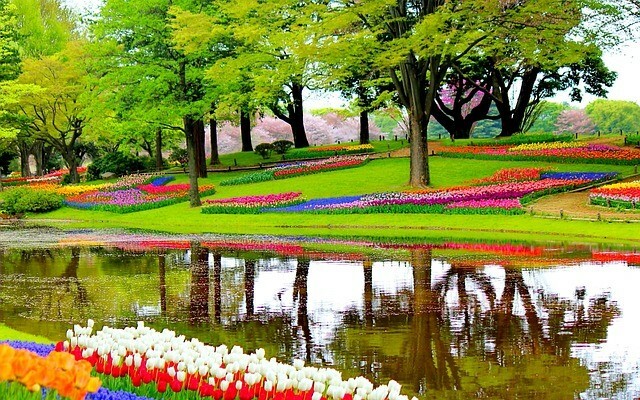 Think of a relationship as being like a garden. Every garden has weeds. But in the garden that has flourishing beds of flowers and vegetables, the weeds are fewer (there is less opportunity for them to compete with the flowers/vegetables), and when they arise, they are of less importance. So, grow your relationship, be intentional, work hard at making it flourish and the arguments you do have will have much less impact. If you try some of these tips, I would love to hear how they worked for you. For more information about this topic you can view an interview with John Gottman (internationally recognized marriage researcher); this guide from the University of Texas; or this book by Joy and Tim Downs.